Installing a DIY Outdoor Kitchen Cabinets — If you are planning for an outdoor kitchen, you can add excellent DIY outdoor kitchen cabinets to it. Besides adding an extra storage space to your kitchen, it will add to your excitement to create something by your own. 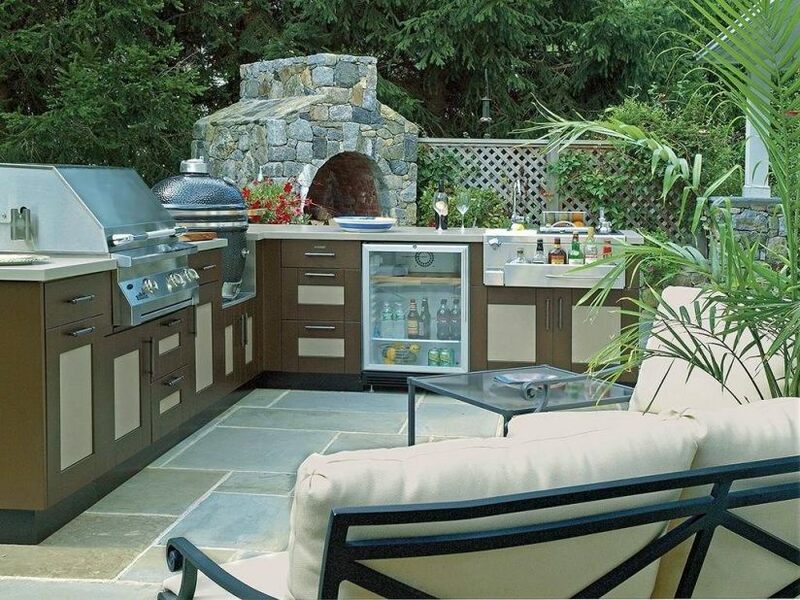 An outdoor kitchen is a good idea if you love to be outside and cook outside. During warm season, cooking indoors can heat up the interiors of your home. Moreover cooking indoors keeps you away from your friends and guests enjoying outdoors on your patio. If you love to be outdoors, mingle with your guests and at the same time cook great food, build an outdoor kitchen. Like in an indoor kitchen, cabinets are of great importance in an outdoor kitchen also. If you are an organized person, you can easily install DIY outdoor kitchen cabinets space. Though an outdoor kitchen does not need much space, it should have proper place for storing tools, equipments and other things required in the kitchen. 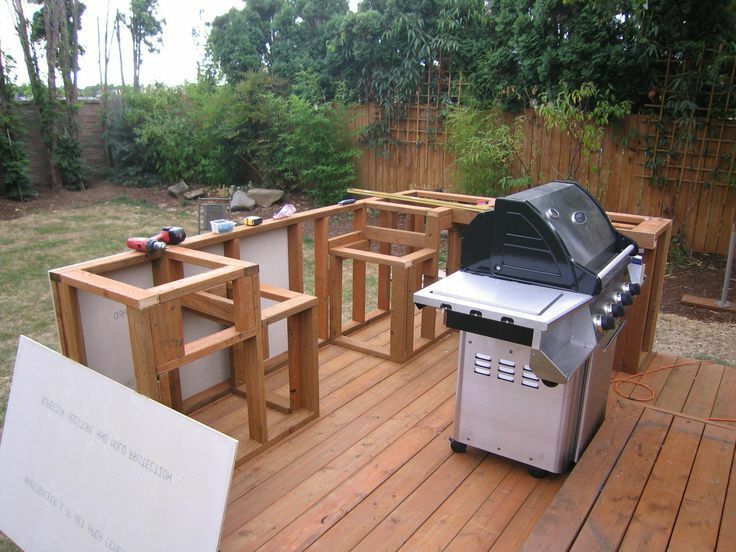 You can follow the steps of DIY project to install outdoor kitchen space explained below. For DIY outdoor kitchen cabinets project, you will require things such as wood, saw, cabinet knobs, handles, screws, hammers, nails, and gloves. Before you start with any thing, you should draw the sketch of the cabinet which will guide you during building of the cabinet. It will help you track any error which you may perform during cutting and putting together the wood pieces. Apart from the regular tools, you may need paint to make those cabinets attractive. In addition, the paint increases the life of the cabinets. However, as this is an outdoor kitchen, you have to protect it from sun, rain and snow by using some weatherproofing material. When planning for a DIY outdoor kitchen cabinets, it is important to know the kind of things you are going to place there. It helps you determine the dimensions of the cabinet very easily. Measure the height and length of each cabinet you are planning to make and add 2 and 6 inch to them respectively. These additional inches in the cabinet make sure that you can place your item with enough room. To determine the width of the cabinets, get an idea about the length of the things you will place there. Once you determine the measurement of your outdoor kitchen cabinets, purchase wood to build these cabinets. You will need wood for the legs, edges and other designs of the cabinets. These wooden kitchen cabinets should be placed at a distance form stove, grill or the oven to avoid any damage from heat. Once you have collected all things required, now it is the time to cut the wood into right pieces according to the measurements you have taken before. Put marks on the wood panel which will help you while actually cutting the wood. Cut the wood into pieces for sides, back, top and bottom of the cabinet. After you cut them, mark each piece about its usage. It will help your when you assemble them. Before you put the pieces together, make the cut pieces smooth by sanding them on edges. Wipe the remaining dust to make them look smoother and neater. To put together the cut pieces of the cabinet, mount the side and back part on the base of the cabinet. First apply wood glue and they secure them with screws or nails. For the door of the cabinet, cut one more piece of the wood. You can either make a large door or two smaller doors. When you are done with all cutting and attaching of wood pieces, add convenience to them in terms of cabinet knobs and handles. In addition, you need to add some kind of edging also at the top and bottom of the cabinet door so that you can latch the doors. Finally paint the cabinet to match the color of your outdoor kitchen. Also add weatherproofing material to make them resistant to sun and rain. Besides adding extra years to the life of the cabinet, it also adds an extra sheen. If you think you will not be able to create your diy outdoor kitchen cabinets from scratch, you can opt for ready-made cabinetries designed specially for outdoor kitchens. These ready-made cabinets are very easy to install. You simply need to place them next to each other and fix them with help of screws. This is one of the easiest ways to attain the outdoor kitchen of your dreams.